In the name of the Father and of the Son and of the Holy Ghost, Amen. Come Holy Ghost, fill the hearts of the faithful, and in kindle in them the fire of thy love. Oh God, who by the light of the Holy Ghost, didst instruct the hearts of the faithful, grant that in the same spirit we may be truly wise, and ever rejoice in His consolation, through Christ our lord. Amen. V. Thou, o lord will open our lips. R. And my tongue shall announce Thy praise. R. Oh lord, make haste to help me. In the name of Jesus and Mary, I salute you St. Michael, glorious Prince of the choir of Seraphim, and all the angels of this burning choir of love. I thank you, Oh holy angels, for your most ardent love of God and Mary, the queen of this choir. Inflame me and all men with your purest Angelic love, that with you we may love God here on earth and one day for all eternity in heaven. One Our Father, Three Hail Marys, One Glory be, etc. In the name of Jesus and Mary, i salute u St. Michael, glorious prince of the choir of the cherubim and all the angels of this choir. I thank you for your great zeal for the glory of God. As one day, you fought against lucifer and his host to defend the honour of the incarnate word and His blessed mother, so now defend us, your little helpless brethren, against the same powerful enemy that our hearts will always be pure and undefiled, real tabernacle of Christ, santuary of the Holy Ghost, temple of the most adorable Trinity. In the name of Jesus and Mary, i salute thee St. michael, glorious prince of the choir of the thrones and all the angels of this choir. O heavenly spirits whom God has appointed to preside over nations, kingdoms, dioceses and religious communities, guide and rule over us inspire and direct the heart of men so that many saints may arise in every nation and ever religious community. In particular, i greet and salute the angel who, by the will of God, preside over our community. Pray, bless and intercede for us. We promise the obedience and reverence. In the name of Jesus and Mary, i salute thee St. Michael, glorious prince of the choir of dominations, and all the angels of this choir. By the will of the most high, you assist confessors, preachers, superior of religious institutions, teachers, and all who spread the kingdom of God. We humbly pray and beseech you, convert the heretics and infidels, bring back to the faith the fallen away catholics, illuminate the mind of men and inflamed their hearts that soon maybe but on fold and one shepherd. In the name of Jesus and Mary, I salute thee St. Michael, glorious prince of this most exalted choir of the principalities, and all the angels of this choir. To your loving care God has committed each parish. You watch over every tabernacle and offer your sanctus in reparation for the scandals, the coldness and indifference of the hearts of men. You pray for the dying and that the little ones may receive the sacrament of baptism. I unite my prayers to yours, especially with the angels of this parish. In the name of Jesus and Mary, i salute thee St. Michael, glorious prince of the power of powers, and all the angels of this most exalted choir. Protect us against the powers of darkness, especially against temptations of pride, anger, and impatience, that with your assistance we may constantly advance on the road of perfection. In the name of Jesus and Mary, i salute thee St. Michael, glorious prince of the choir of virtues, and all the angels of this heavenly choir. You assist pious souls in the most important task of their purification. Assist us, o holy angels, assist us oh holy angels, that we will not only have the will, but adopt the means, that we may never dread the sacrifice but with your help and assistance we acquire one virtue after another so that the splendour of God's own sanctity may be reflected in us. 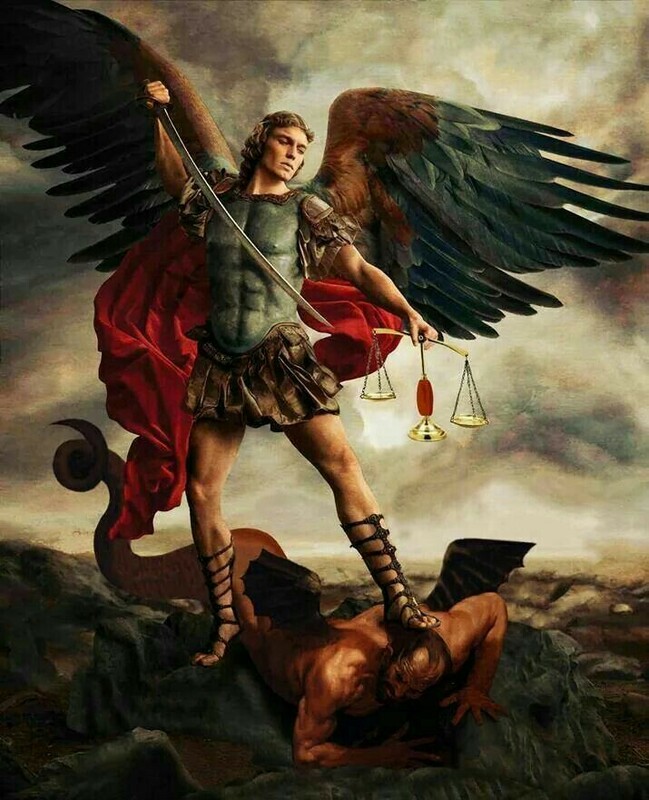 In the name of Jesus and Mary, I salute thee St. Michael, glorious prince of the most exalted choir of the Archangels, and all the angels of this Choir. Glory and thanksgiving be to the Father and to the Son and to the Holy Ghost for creating you and for assuming from your midst the seven Archangels who stand before the throne of God. we most humbly pray and beseech the Holy Archangels to teach us and those dear to us the science and wisdom of saints. In the name of Jesus and Mary, i salute thee St. Michael glorious prince of the most exalted choir of the Angels and all the Angels of this choir. Paused in awe and astonishment, God has appointed one of the princes of this heavenly host to be the custodian of every man one of them is appointed to watch over me, to guide, to even served me. My faithful friend, my deares brother in the Holy Angel. I greet you a thousand times in the name of Jesus and Mary, i thank God that He made thee so beautiful and so powerful. Oh glorious prince St. Michael, chief and commander of the heavenly host, guardian of souls, vanquisher of rebel spirit, servant in the house of the divine king and our admirable conductor, who does shine with excellence and superhuman virtue, vouchsafe to deliver us from all evil, who turn to thee with confidence, and enable us by thy gracious protection to serve God more and more faithfully everyday. V. pray for us, oh glorious St. Michael, prince of the church of Jesus Christ. Oh burning seraphim enkindle in our hearts the fire of charity. Amen. V. Pray for us, O gracious St. Michael, prince of the church of Jesus Christ. Sanctify us we beseech thee, O Lord, with thy holy blessing, and grant us, by the intercession of Michael, that wisdom which teaches us to lay up treasures in heaven by exchanging the goods of this world for those of eternity, thou who live and reign world without end. Ardent Seraphim, you who dwell in the eternal home of love, unceasingly absorbed in the rays of the sun of justice we beg you in virtue of the Divine Blood, to enkindle in our hearts that holy fire with which you are consumed. St. Michael, the archangel, and all you holy angels, protect us in our combats that we may not perish in the tremendous judgement of God. Glory be to the Father, and to the Son and to the Holy Ghost. As it was in the beginning, is now and ever shall be, world without end. Amen. Bright Cherubim, you who are allowed a deeper insight to God's secrets, dispel the darkness of our souls, and in virtue of the Divine Blood, give that supernatural light to our eyes that will enable us to understand the truth of salvation. St. Michael, the archangel, etc. Sublime Throne, dazzling in your beauty, upon whom rest the almighty and who conveys His commands to the inferior Angels, obtain for us in virtue of the Divine Blood, peace with God. Supreme Dominations, you who have authority over all the angelic choirs, and are charged with the execution of God's order, rule over our minds and hearts, and in virtue of the Divine Blood, help us to know and faithfully accomplish the will of God. Invisible Power, whose mission is to remove the obstacle to the Divine will, and to overcome it's enemies, defend us and make us victorious in our combats against the evil powers. Heavenly Virtues, who watch over the harmony of material creation, you whose name signifies "strength" have pity on the Divine Blood and give us the grace to bear with patience the trials of this life. Anthiphon: oh most glorious prince, St. Michael, the archangel, be mindful of us, here and everywhere, and always pray to the Son of God for us. Response: I will adore thee in thy temple and I will confess thy name. Oh God, who has in an admirable order disposed the ministry of angels and of men, grants in your goodness that our life on earth may be protected by those who in heaven always assist before your throne ready to do your will. Through our lord Jesus Christ. Amen.